Gregor Fitelberg, Eugenia Uminska, The Philharmonia Orchestra. 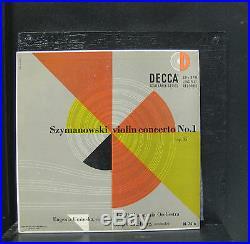 Szymanowski Violin Concerto No. Label: Decca Format: Mono / 10 33 1/3 RPM LP Country: USA Vinyl Condition: VG+ Cover Condition: VG+ Year Released: 1951 LP Quantity: 1 Catalog #: DL 7516. Record has been cleaned and new sleeved. Actual item pictured, not a stock photo. Double LPs, box sets, etc. All records are packed in a new record mailing box tested 200 lbs. Over ten years of grading nearly a million albums, Shuga Records has developed a consistent and conservative method for objectively grading the condition of everything we sell. All recordings are visually inspected under high-intensity lights, using our customized grading system. New Still-Sealed Mint (SS): When someone says somethings Mint condition, this is what theyre talking about. The album is sealed in its original packaging and has never been played. Mint (M-): This is the highest grade for records that have been played. The album is in excellent condition and shows no visible signs of wear or damage that will affect sound quality. VG+: While not flawless, the condition is very good, showing only minimal signs of use. Any visible blemishes should have minimal affect on play quality, though light surface noise maybe present at very quiet portions or between tracks. This is a record that should satisfy all but the most strict of collectors. There may be slight ring or cover wear, or minor writing on the cover. VG: Vinyl may have scratches and/or other visual blemishes, but should play through without skipping or repeating. Light to moderate surface noise and/or crackle may be present, however not overly distracting. Covers may have moderate ring and/or edge wear, cut-outs / hole punches, or a moderate seam splits. VG- and below: Lets be honest: sound quality is low and the cover may be in very poor shape. We consider any item graded at or below VG- as a LOW GRADE item. We only sell albums rated VG- and above unless a record is so rare that its presence in the collection transcends the poor quality of the vinyl or cover. Note: Our custom grading system is not based on the Goldmine system. Operators are available 24 hours a day/7days a week. Please leave a message if no one answers. We will get back to you as soon as possible. 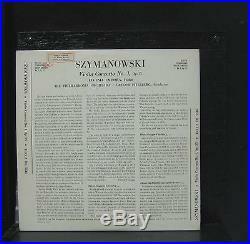 The item “Gregor Fitelberg Szymanowski Violin Concerto No. 1 10 LP VG+ Vinyl Record” is in sale since Friday, June 17, 2016. This item is in the category “Music\Records”. The seller is “shugarecords” and is located in Chicago, Illinois. This item can be shipped to North, South, or Latin America, to all countries in Europe, to all countries in continental Asia, to Australia.